We are offering this beautiful 'Baltic Amber (Oval Cut, 14x10mm) Ring', set in Sterling Silver, in a ring size 6.5 as part of our Fashion Jewelry line. Baltic Amber dates back to over 44 million years ago & is a natural organic substance that resulted from fossil resin produced by pine trees in multiple regions. Fossil resin that contains succinic acid in Amber is thought to bring good fortune & positive health to its owner. The Chinese continue to be the leader in buying up gem and fine quality Baltic Amber gemstones. The greater demand & consumption for Amber has skyrocketed wholesale & retail prices. 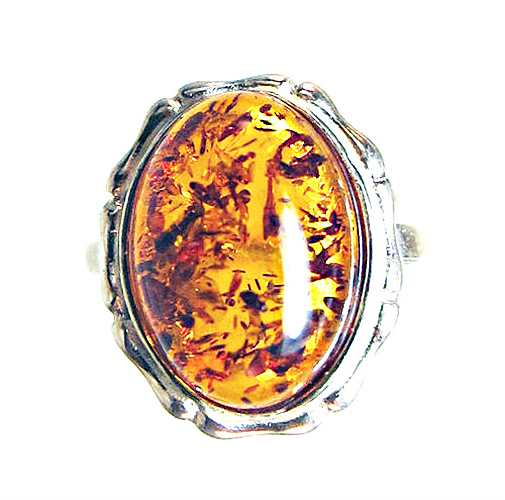 Click the button below to add the Baltic Amber Silver Ring to your wish list.